I don’t believe society is perfect the way it is, I’m just a small-c conservative who’s cautious of changing things. We’ve never tried a complex globalized urban Information Age society with communist/libertarian/reactionary policies, and if you accidentally bring down civilization an “oops” isn’t going to cut it. In real life I’m pretty risk-averse and that shows politically. And when I find sweeping revolutionary changes I would be up for, by bad luck they’re all ones well outside the mainstream of debate, which focuses disproportionately on stupid tribal issues anyway. So I am a terrible political activist. But I have spent the last thirteen years constructing a utopian society in my basement. I’ve been reluctant to bring it up here, because it is not relevant to sober politics, parts of it are amateurish and unfinished, and it makes the worst extremist look sane and grounded in reality. And I was afraid it wouldn’t really make sense without a little bit of the background of the world it takes place in. In the north of the planet Micras lies the island of Raikoth, about the latitude of Iceland and the size of Great Britain. In the present day (the 51st century ASC) it has a population of about 8 million – similar to that of Honduras or Israel. 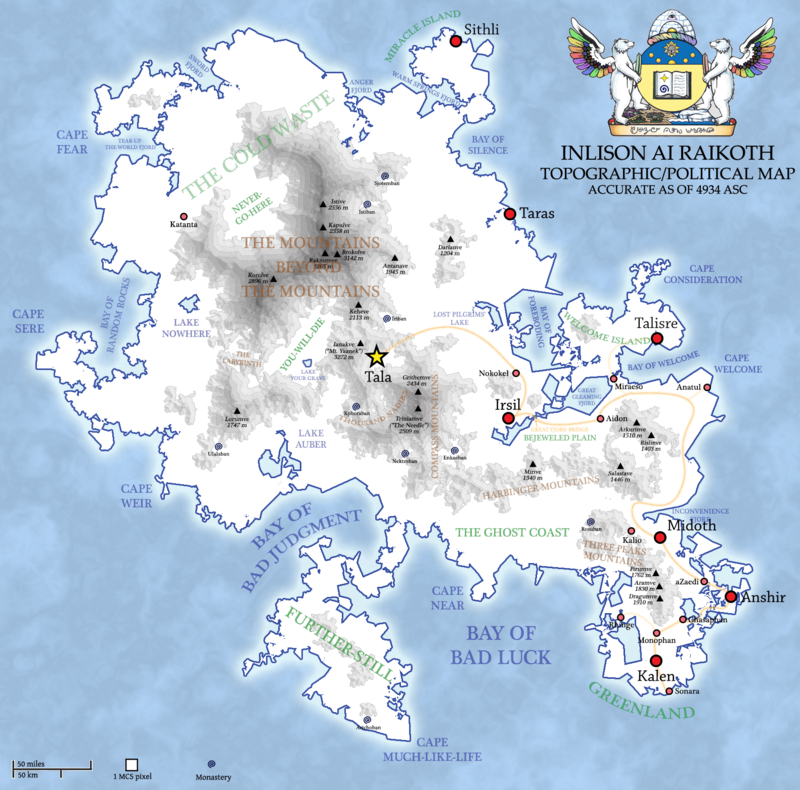 Map of Raikoth. Click to expand thumbnail. Raikoth is an ancient civilization, but during the 11th century ASC they ceded their sovereignty to the Holy Empire of Sxiro, a sprawling feudal conglomeration occupying nearly the entirety of the continent to their south. In exchange, the God-Emperor of Sxiro granted them extremely favorable terms including almost complete self-government. In all situations, the government of Raikoth will take the normatively correct action. For most of the 5th millennium ASC, their laws insisted that the Platonic Ideal of the Good was both head of state and head of government; this was relaxed in 4682 to allow the Archpriest of Joy to serve as head of government, again at the insistence of a confused and annoyed Sxiran God-Emperor. The Raikolin themselves are happy to explain the secrets of what they consider their success, though no other land on Micras has quite taken them up on the offer. They attribute it to three principles which they have pursued to their logical conclusion: Perfect Language, Perfect Government, Perfect Population. Early in their history, the Raikothin state was plagued by politics. Everyone had a different opinion for which way the state should go, everyone thought everyone else’s opinions were wrong, and debate was interminable, hostile, and unable to make any inroads into the problem. Some began to wonder if the problem was the inherent slipperiness of language. Poor language encoded false assumptions about the world, allowing conflation of factual statements, value statements, and meaningless feel-good cliches. It led to confusing categories, framing effects, and a bad habit of reifying ad hoc concepts. Luckily for Raikoth, an unusually high percent of its population were logician-monks (don’t ask) in a good position to begin working on an alternative. Starting with an outlook akin to logical positivism, they invented a language whose grammar was identical to philosophical rigor and in which every concept had to be expressed precisely. Cheap shots, ad hominem attacks, rhetorical tricks, appeals to emotion – all were painstakingly prohibited by careful choice of vocabulary and syntax, and ambijectivity is carefully collapsed into its component pieces. The thorniest problem was moral speech: what should “good” mean in a perfect language? Here the logician-monks spent millennia refining a utilitarian superstructure until it described exactly how to aggregate preferences to create a utility function for the entire society. The resulting book, the Risurion-Silk, was declared to be literally an incarnation of God, who was, after all, only another word for the concept of maximal goodness. “Good” was declared to mean “increasing the function described in the Risurion-Silk” or alternately “increasing the degree to which the Universe instantiates God”. Thus was born Kadhamic, the perfect language. Having developed it, the government merely banned all discussion of politics in any language other than Kadhamic. This had two salutary effects. First, it prevented anyone who lacked the intelligence to learn Kadhamic from participating in political life. Second, it ended the worst sorts of political disagreement almost overnight, as constructing specious arguments for false positions became difficult or impossible. Nevertheless, substantive political disagreement – genuine debate about facts or values – still remained. Before the Fallow Time in the 35th century ASC this was mostly addressed by a parliament of representatives from the nine cities, but during the leadership of High [untranslatable] Nithi Kirenion and afterwards, a more elegant system was put in place: the rule of the the Angels. An Angel is a creature that bridges the gap between God and Man. The Angels of Tala, the capital of Raikoth, are massive computer systems that allow humans to make calculations about the value of God as instantiated in the Risurion-Silk. City map of Tala as it was eight hundred years ago, before the Shining Garden era. Click to expand thumbnail. The Angel of Preference takes census and survey data from every citizen of Raikoth, runs it through the series of utilitarian superstructure functions in the Risurion-Silk, and spits out a utility function. Its calculations bear the same resemblance to the QALYs and DALYs of today as a supercomputer does to an abacus. What it ends up with are a series of preference weights for possible world-states and for various subcomponents of those world-states. It knows the marginal value of saving three people from poverty and how that compares to the marginal value of decreasing water pollution 6% in the Great Gleaming Fjord, or of one new baby being born in Uolrhaphen. The Angel of Evidence is a system of linked “oracles” – what we would call prediction markets – heavily subsidized by the government and played not only by thousands of Raikolin but by the great financial conglomerates of Sxiro and even further afield. Fed sufficient time, money, and publicity, it can calculate the likely effects of any policy with an accuracy even the Priests of Truth cannot match. When Endi Arusion wanted to declare sanctions on Lirikoth, he asked the Angel exactly how long their rebellion would last; according to legend, it got the length of the centuries-long conflict correct to the day. The Angel of Salience accepts suggestions from anyone on Raikoth, whether they be a destitute fisherman or a High Priest of Joy. These suggestions can be any form of policy change, whether that be tax relief, new land use regulations, or the invasion of a foreign power. The thousands of suggestions it receives each day get crowdsourced, with average citizens and experts giving them upvotes or downvotes whose weight is proportional to those users’ past success rates. Eventually, the most creative or well-thought-out proposals rise to the top and become salient for further investigation. The Archangel, located in a vast temple in the Gardens of the Dead, combines input from all three Angels to render government decisions. It takes policy proposals from the Angel of Salience, uses the Angel of Evidence to estimate their likely effects, and finally runs those effects through the Angel of Preference to determine whether they would raise or lower the utility function represented therein and so bring the world closer to or further from the Divine. The set of noncontradictory policies that most satisfies the Angel of Preference becomes the law of Raikoth. In her landmark work on governments, Zelde Kalirion once called Raikoth a “totalitarian anarchy”, and with good reason. The Angels’ decrees are entirely impersonal. It might demand a city uproot itself and move elsewhere, or strike down a doctrine in the national religion, or even tell everyone in the country to render a certain number of opals to a certain engineering company in exchange for their constructing a bridge. Yet there is no single entity called “the government” which executes these requests. There are the Rhavakal, a self-contained chivalric military order with an obsessive focus on martial arts – and occasionally the Angels order them to invade things or arrest people. There are the Priesthoods of Truth, Beauty, and Joy, three very wealthy and powerful religious groups – and occasionally the Angels order them to take care of some errand. There are a host of companies whom the Angels sometimes order to perform one task or another. And there are normal everyday citizens, whom the Angels often ask for financial support for one of their plans or another. But all of these groups alike are simply tools whom the Angels make use of. And so – with the possible exception of the Priests of Joy, whose tasks include maintaining the Angels’ physical forms and tweaking their algorithms – none of them consider themselves (or are considered by others) part of a body called “the government”. “Galisyin” means “the gardened ones”, and it is a name the Raikolin give themselves. They believe that even a perfect government cannot help bad people, and even a flawed government cannot keep down good ones. A disaster eight hundred years ago led to the ideology of istilve iab istisemial priktino – “fractal perfection of which every part is itself perfect”, in which the innate virtues of the Raikothin people must be robust enough to survive even a total collapse of their society. The punishment for most serious crimes is exile – either to the many colonies like Kymrikoth, Kalirphanam, and Psentikoth, or to monasteries in the mountains (which serve about the same role prisons do in our society except that instead of hanging out with hardened criminals they mostly hang out with monks and do monastic labor, meditation, and study). In either case, they are effectively removed from the breeding population for long periods, sometimes forever. Finally, as a country that passed the demographic transition a few millennia ago, the natural fertility rate is well below replacement. The Angels keep the population at their desired level by paying people to have and raise children, and the highest price is given for people who are willing to use gametes selected by the Priests of Truth as unusually likely to create good people (where “good” is as always defined as “tending to increase the function described in the Risurion-silk” but usually involves intelligence, compassion, sanity, health, and creativity). Although these three measures do relatively little over the space of a single generation, over hundreds of years they have transformed the populace to one that scores well above the Sxiran baseline on nearly every desirable trait. In addition the Galisyin ideal includes euthenics – bettering people by improving their environment. My old Biodeterminists’ Guide to Parenting is an very Raikothin way of looking at the world and its suggestions (refined and tested by centuries of constant study) are law, sometimes holy law. Some euthenic interventions are more proactive: for example, there is an exactly optimal amount of lithium in the water supply. There’s even occasional eradication campaigns for toxoplasma (at least in men), although the Arctic location itself does most of the hard work in decreasing parasite load. Along with the biological work comes the education, which has almost nothing to do with what our own society calls by that name. There is little attempt to teach history, science, music, or grammar – it is assumed that a correctly biodetermined population with access to free libraries will pick all of that up by themselves. Instead school is entirely about instilling good habits of mind that will make people virtuous and prosocial citizens. The curriculum is heavy on meditation; students spend five to ten years meditating for an hour a day under the guidance of Priests of Beauty who are expert in the discipline. The goal is to achieve near-perfect self-control, low anxiety, compassion for others, and lasting happiness (if any of the studies showing that meditation improves academic performance prove true, that’s just icing on the cake). A second class that wouldn’t be recognizable in real-world schools is Experimental Theology, aka nationwide school-sponsored drug use. The idea here is that years of research with chemicals like LSD and psilocybin have put their ability to permanently positively alter personality on a sound scientific basis, and as children’s minds develop they are inducted into different levels of mystical experiences with these drugs in ways that give them more love, energy, and feelings of community. The third and most important class is rationality. This class is the difference between dystopia and utopia; it intends to teach everyone the rationale behind their society and give them the tools to engage in politics or choose not to do so. First is instruction in the perfect philosophical language Kadhamic. Then is instruction in a sort of turbo-charged form of critical thinking only possible in Kadhamic (but which I’d like to think the Less Wrong Sequences are a close vernacular approximation to). Then come enough math and science to understand something sort of analogous to our Rational Choice Theory, Game Theory, Evolutionary Psychology, Decision Theory, et cetera – things necessary to understand morality and government design. Finally comes an investigation into morality, the justifications behind the Risurion-silk, and the heretical logics which compete with it. At the end of these lessons comes a sort of rumspringa, where young men and women leave the Shining Garden and tour the rest of Sxiro and the world, observing its freest and richest regions as well as its poorest and most desperate. They are then offered a choice between returning to Raikoth, living in the “colonies” – a series of outlying lands inhabited mostly by Raikolin who reject the heavily ordered life of the Shining Garden – or moving to mainland Sxiro. Those who choose the last option are given free remedial training in the Sxiran language and help integrating into local culture – but most find it bizarre, off-putting, and barbaric, and choose to stay in Raikoth after all. During adult life, Raikothin continue their self-cultivation with the help of the Priests of Beauty, who are sort of combination clerics / counselors / psychiatrists. They have more the friendly attitude of a pastor than the saccharine attitude of a therapist or the clinical attitude of a doctor, but if necessary they also have the expertise to prescribe a mind-boggling variety of drugs and supplements, many completely unknown or ridiculously illegal here on Earth. They differ from more typical therapists in having complete confidentiality; they are forbidden from reporting their flock to the authorities or to mental institutions for any reason (other organizations do have those powers, but don’t interface with the Priests of Beauty). This tends to inspire a relationship of trust, and the Priests of Truth watch them to make sure they deserve it. Those who desire a level of perfection beyond that of normal Galisyin head to the monasteries, about a dozen or so isolated communities the size of small cities in the high mountains. There they grow their own food, meditate, study, and try to live more or less in harmony with nature. Several monasteries are under oath to take in anyone who wants to join them, setting a valuable floor to the level of misery and poverty anyone has to put up with. This is the first time I’ve shown Raikoth to anyone outside the tiny community of conworlders, so if you have any questions ask and I’ll try to expand upon them. This entry was posted in Uncategorized and tagged conworlding, raikoth. Bookmark the permalink. Yes, it’s a holy city located on a particular holy site, and has a very small population. Kalen is the largest city and the financial/cultural/etc capital. It’s not quite as small as it is in the city map shown, but that should give a pretty good idea. The considerations you mentioned are why every other major city is located on the east coast (the coast with the more moderate climate). Did you draw those pictures? I drew some. Others I generated with different programs (the map is FractalMapper + Photoshop; the city map is Bryce + Photoshop). Still others I lifted from real world sources; for example, the coat of arms is heavily based off of Nunavut’s and a few others. 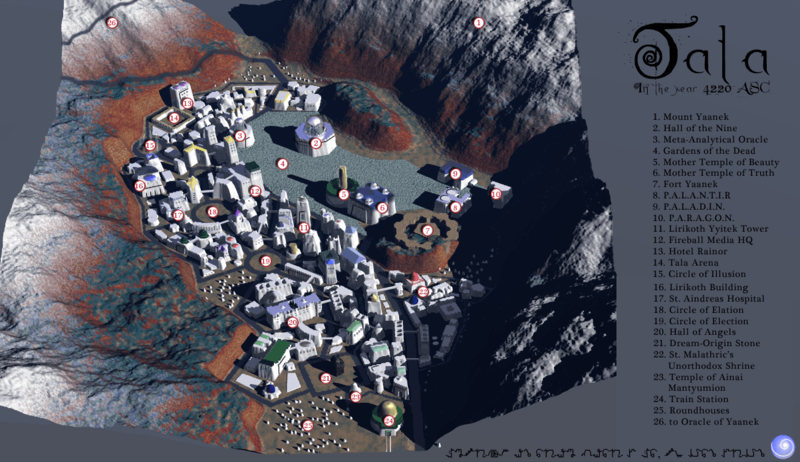 What did you use to make the 3d city picture? Bryce and Photoshop. If you’re familiar with Bryce I can tell you the technique I used, which is easy enough that it feels kind of like cheating. From the description of it, Kadhamic doesn’t sound like a language at all, and much more like something akin to a very specific way of seeing the world with a normatively rigorous jargon attached to it. Kind of like judiciary speech. Is there anything you can share about the structure of Kadhamic or the pre-Kadhamic Raikothin language? I’m afraid to try because I’m terrible at linguistics and my few constructed language attempts tend to seem plausible right up until the point where I try to explain them to anyone who knows what they’re talking about. I have down that the vernacular is agglutinating, VSO, and pretty fluid about parts of speech. It used to have gendered nouns, leaving a few relics here and there, but it didn’t used to be. There are a lot of modifiers that can be optionally added to words but don’t have to be – for example, it’s acceptable to state a verb without any tense. “aiph kigai arabaradi minki” means “the dog is in the blue house” in the form “exists dog-the in-house-the blue-the”. – It follows E-Prime in throwing out “to be”. – Assertions require probability statements. There’s no grammatically correct way to say “The dog is in the blue house” without adding some modifier for how certain you are of this (probably along the lines of “tautologous, near-certain, probably true, uncertain, probably false, near-certainly false). There is also the option of elegantly expressing particular numerical possibilities. – Assertions about plurals require quantifiers. For example, it’s ungrammatical to say “Atheists break the law”. One has to clarify this by adding “all”, “most”, “at least one”, “a disproportionate number”, etc. It’s pretty hard to stereotype in Kadhamic without meaning it. – Verb mood indicating level of evidence – for example, personal opinion, hearsay, proven in randomized clinical trial. – “Should” always requires a following “if…” statement; ie only hypothetical imperatives. – Dictionaries give suggestions for determining class membership, but there is also a precise vocabulary of words similar to our “pseudo-” and “quasi-” for discussing how things differ from typical class members. – Moral language limited to claims about which things increase or decrease which functions described in the Risurion-silk. The thing about a judiciary language makes sense except that it tries to engage natural language instincts. For example, if in English I said “I want to your idea”, it would be immediately obvious that something is screwed up here – in mathese, the function “want to” is missing an argument. I’m envisioning a language where saying “should” without a following “if” statement sounds just as awkward. In my personal opinion this is near-certainly fantastic. No evidentials? I envy languages where people are obligated to indicate why they believe what they’re saying. How are evidentials as you’re thinking of them different from “- Verb mood indicating level of evidence – for example, personal opinion, hearsay, proven in randomized clinical trial” ? You’re right– it was there. I looked for it several times and didn’t see it. And when someone asks about the “if. . .” and why we should do it, we then have to phrase that as a hypothetical imperative, and then the same with its if clause, and on and on forever? Less good for “If you do not want to kill someone, you should not randomly fire your gun out the window,” because in fact, you should not kill someone, even if it really floats your boat. and thus have to clarify if your ethical “should” relies on virtue-ethics, deontological or consequentialistic metaethics. And then we merrily trot off on the infinite regress. Whether virtue-ethics, deontological or consequentialistic metaethics, it doesn’t matter. Because then you would just have to say, “you should be a good person.” or “you should follow the ten commandments” or “your actions should be beneficient for society” — except that those, too, would have to be hypothetical imperatives. This is utterly brilliant and I doubt it would survive contact with reality. Probably this is because I don’t think the root cause of politics actually is the inherent slipperiness of language. (Though it certainly doesn’t help.) Even if you do have the perfect language, and even if all debates must be only in that language, you’d still have disagreements over values. And you’d still have fanatics fighting for those values even if they know that utilitarianism tells them not to. Smart fanatics might even intentionally decide to precommit to rebel against the Angels if they do anything against Favored Cause X, so that the Angels know ruling against X results in negative utility. You could maybe get rid of those over centuries of cultural engineering, but then the first group of non-Raikothin to be allowed entry will throw off the utility function in their favor. I just looked over my notes on the Risurion-silk and realized it doesn’t include a chapter on decision theory. Good catch. Hopefully the fictional people who have had thousands of years longer to think about this didn’t make that mistake, and the Angels’ decision theory includes a public precommittment to ignore and/or punish anyone who makes threats of rebellion. Can you give me an example of fanatics fighting for a value even though utilitarianism tells them not to, and of what they might do, and of what problems it might cause? I can only imagine the problems being factual (in which case they end up subsidizing the prediction markets until they give up in disgust) or moral. There are two forms of moral disagreement: believing that the way the Risurion-silk aggregates happiness/preference does not correspond to what we want, and believing that aggregating happiness/preference isn’t the correct thing to be doing anyway. The first form of disagreement is considered acceptable and often discussed. It’s considered extremely important (and beneficial to happiness/preference) to have everyone on the same moral system so that government can be unified and coordinate everyone, and the Risurion-silk is a strong Schelling point, so no one wants to get rid of it except in the most extreme circumstances. People who object to the Risurion-silk in this way are either extreme esoteric philosophers or totally confused; the former group have been arguing about it for the past eight hundred years without result, and the latter group never get very far. For a while the proponents of a rival logic called Dragumve-silk seemed to be gaining power, but a compromise was struck in which the Dragumvelin founded a colony on the island of Psentikoth. For a while everyone checked to see if their colony seemed to be doing significantly better, and when it didn’t the controversy kind of died down. The second form of disagreement is met with a polite suggestion that Raikoth is an intentional community, that if you don’t like the tenets of the intentional community you don’t have to live there, and an offer to pay the relocation costs to a colony or mainland Sxiro. Non-Raikolin have a lot of trouble gaining entry into Raikoth. Legitimate reasons to want to go to a freezing island in the Arctic hundreds of miles away from anything else are few and far between, so it’s not like they have a big illegal immigration problem. Legal immigration is offered to anyone who can learn fluent Kadhamic as an adult, which when combined with desire to move to Raikoth turns out to be a very self-selecting population. [I would think] the normal way you would get political disagreement is if people disagree about the “we” they are being utilitarian for. Clearly Risurion-silk is intended to optimize the joint welfare of everyone in Raikoth, but not of everyone on Micras. But what if some subset of the Raikolin start to feel like they should be optimizing for that subset’s welfare, and not for Raikoth’s welfare as a whole? In a utilitarian society, things can get redistributed from people who want them to people who need them. For example, probably the people of Kalen and Anshir are getting taxed pretty hard in order to support the people up in Tala with no fishing or agriculture. Kalen and Anshir probably would notice fairly quickly that, if they withdrew from Raikoth and implemented Risurion-silk just among themselves, they would be better off. It’s not even clear that this would be immoral: if Raikoth doesn’t ship its surplus to impoverished nations in Mithras, then why should Anshir be obliged to caravan its surplus to impoverished cities in Mithras? Politely suggesting that Anshir and Mithras relocate to Sxiro seems unlikely to solve the problem. I don’t expect this would lead to actual secession, any more than rich people have seceded from the USA to avoid being taxed for welfare. But it would certainly lead to a lot of acrimonious political disagreement. Chapter Six (other notes say Seven) of the Risurion-silk gives a discussion of moral communions similar to the one here. It discusses optimal communion size, which takes into account factors like whether people’s values align (a communion of half Western secularists and half Saudi Muslims would be miserable for both groups), the ability of larger groups to get more done, and just plain Schelling points. In practice, this is mostly taken care of by the Raikolin being the only people who follow the Risurion-silk, which when combined with them being an island makes them a natural communion. The Raikolin heavily discount obligations to other countries because they think they are too screwed up to matter. It’s about the same logic people use when not donating to Africa because the money would just go to fund some warlord, or infrastructure that gets destroyed in the next rebellion. The official position of the Vankarha Sui Mek is that the Risurion-Silk also perfectly describes the good for foreign nations, but that these foreign nations may without transgression choose to form separate communions that pursue the Risurion-Silk independently. The Risurion-Silk, they say, forms an infallible guide both to determining the borders of these communions and to determining how they should interact. Once the entire world operates according to its rules, these communions will form a macrocommunion under the Risurion-Silk while still maintaining their individual character. That communion will work as a single organism to bring the world to absolute perfection in the most effective manner possible. This is why the Risurion-Silk is sometimes also called yyevidaimi patapatn sumrlaister, or “the step by step manual for the manifestation of God”. I think rebellion would be at least as unthinkable as in the modern US, and maybe more – this IS a theocracy. I also think the government would be extremely willing to fight a war to prevent rebellion and everyone knows that. I ALSO think such a rebellion would have to get the approval of the Imperial government in Sxiro, which the God-Emperor would never grant. Despite all of this, I don’t think there’s much inter-city subsidization going on, but I’m not sure why – I’ll have to think about it more. Tala, for its part, doesn’t need subsidies – it has a tiny population and is super-rich from pilgrimage-related income. I love how I bring up an objection and there’s centuries of debate already answering it. Awesome. The example I was thinking of was Fred Phelps and the WBC. Telling them it’s not the utilitarian thing to do, even if they believe you, won’t stop them. But I’d expect that generalizes. The more reasonable bigots also know that utilitarianism says they’re wrong, but they don’t care because they’re not utilitarians. If the Angels (or any source known to be unfailingly reliable) told the current U.S. that segregated schools would increase utility, there would still be armies of non-crazy people opposed to segregated schools. Any of those could be seen as fighting for a moral value at the expense of utility. I would beg to differ on the non-craziness of those people. Just because they’re on my side doesn’t make them sane. This is one reason I was so interested in After Virtue’s claim that protest was linked to our society not having any normative values. If they’re not being disruptive, I think everyone would ignore them. If they were being disruptive, I think the police would clear them out very quickly and mercilessly. This isn’t the US and there’s no weird loophole in the First Amendment for the WBC to hide behind. And the hope is the knowledge that this would happen and the long history of it happening would make protesting less of an obvious win than it is in the US today and so people wouldn’t bother. I also think some of that years of education in compassion and prosocial behavior thing would help here. By definition, “everyone” does not agree to them, because there would be no one to protest. To which the obvious retort is that it is the fault of other people that they were born in this country, it is their home, and since it’s other people’s fault, they can go live their intentional society elsewhere without disrupting the lives of those whose lives they have set up to be disrupted if they don’t live. This would seem to be an argument against any intentional society ever lasting more than one generation, even if 99% of the populace supports it. It also seems by extension to be an argument against anything but a minarchist libertarian society, again even if 99% of the populace supports it. I would argue that everyone already lives in intentional societies, they’re just very poorly designed and have no exit rights. And this is a problem how? One notes that intentional societies don’t generally last one generation, never mind more. If, in fact, human beings don’t fit intentional societies, especially when they last more than one generation, perhaps it’s the society, not the human being, that’s the problem. But it remains a fact that it was other people who brought them into that country and made it their home, and are now insisting that they disrupt their own lives rather than those of the people who forced the disruption. WOW this is awesome!! Thanks for sharing! Its interesting that you made your world rather religious, is there any particular reason? Also you don’t seem to like “virtue” or “virtue ethics” in real life so why did you decide to create a society that makes it a priority? I made it religious because I really really like religion, except for the part where it’s wrong. I like how all the studies show that religious belief improves physical health, mental health, charitable giving, and a host of other useful values. I like how it creates a sense of community. The Berkeley rationalist community is amazing for probably much the same reason that religious communities are amazing, but I don’t know whether a community based on rationalism could be so successful in a rationalist society where they’re not really distinguished from the general populace. I think people are going to want something like a religion anyway, and it’s probably good to have a good one that’s part of the social system rather than a bad one that contradicts the social system. I also found that enough of what I was doing with Raikoth resembled religion that it might as well be called one. A lot of the problem of government is getting people to agree to certain Schelling points and then stick to the ones they agreed on. I find calling things “holy writ” helps with that. Finally, I think people are just more willing to trust someone who’s a Priest rather than someone who is the Designated Mental Status Maintenance Technician or whatever. I relate to this so much. Sometimes I feel like I was born to be a monk of a religion that will never exist. I recently came across this through Dan Fincke’s blog; it’s an attempt to start an irreligious “culture” (as he refers to it), which seems to be (in part) an attempt to satisfy the desire for a religion among atheists. Atheist church was kind of a popular idea in the 19th Century. I’ve just always found all of those to be extremely hokey (Unitarians, for example) and not produce the same advantages of religion at all. Saint-Simon lives! You were clearly born in the wrong century. And I’m sick of it when the Reactionaries on IRC start asking leading questions about how I can possibly believe everything in society just happens to be perfect the way it is. I could understand this coming from any other group. Reactionaries, however, believe that everything in society just happened to be perfect a few hundred years ago. Apparently, to them, this is fine, but the idea that everything happens to be well-adapted now? Whoa, nellie! I really don’t understand why a community of rationalists tolerates these clowns. I…not sure that’s really accurate, although their inability to update on a lot of obvious stuff is tiresome. It isn’t acurate for Moldbug who is the urexample. It also isn’t accurate for me. Is Moldbug really the ur-example of reactionaries? He seems to have more wierd ideas (like the neocameralism and the crypto guns). He is the urexample of Dark Enlightenment political theory. Which is basically what NeoReaction is. Which is basically what people who see reaction isn’t SuperCharged Republicanism mean when they speak of me. If you do not understand something, that is a fact about your mind, not a fact about the thing. Have you tried thinking for five minutes about all the possible reasons, then ranking them in order of probability, and then figuring what could be evidence to differentiate? If not, maybe doing so will make this thing a mystery no longer! 1a. Modern technological advances (including but not limited to modern agriculture, communications, transport, food preservation, storage, and production) and modern population densities have not affected the optimal form of government. 1b. Government was optimal before the introduction of liberal democracy. 2. Entirely by random chance, a system of government was developed and then overthrown long before it would become the optimal governing system. I have yet to see coherent justifications for either of these propositions. Just wondering, is the massive post debunking reactionary thought coming soon, or was that idea abandoned? It’s on my list of things to do, but this also has entries like “achieve enlightenment” and “invent perfect philosophical language”. Meanmwhile I need make my giant reconstructionism post sometime. Might make the first blog post. Sorry, it’s impossible. There’s a tradeoff between being concise and being comprehensible (given a reasonable amount of time to think) and there isn’t really a Schelling point along that dimension that you can call ‘perfect’. Maybe maximally concise is a Schelling point, but then expressing something in your language would be uncomputable. Well, now, that depends on what you define as perfect. The optimal trade-off of constraints, perhaps. That’s what I was getting at with the Schelling point stuff. There is no optimal trade-off, since it depends on things like the intelligence of the speaker and the listener. I suppose the problem is that preference between languages is ambijective, so there can’t be a perfect language any more than there can be an optimal work of art. Ah, but you assume here that it is intended to be used by all humans! No, I’m way more elitist than that. The obstacle is that there is intelligence variation even within the set of interesting people. – Something can be a series of trade-offs, yet also “perfect” in the sense that its only flaws are those that trade off against other flaws, rather than simple mistakes. For example, English could clearly be much better than it is without trading off against anything except inertia. – I had an interesting discussion with Luke in which he pointed out that things we spent long times thinking were matters of opinion frequently end up having objective right answers after all. His example was information theory, which gives ways of objectively establishing which of two things is more “complex”, previously a weasel word. This is amazing. Utterly amazing. And it’s making me want to articulate my (real-world) philosophy of reconstructionism (a reaction to reaction) and write about the Asgardian Eigenmensch Empire. I would be in interested in reading about your philosophy. MetaContrarian ladder climbing is always fun. Reconstructionism is not actually strictly meta-contrarian off of reaction, although it wouldn’t exist if not for both progressivism and for reaction. You might get a little bit of (a lighthearted) idea if you read my twitter. One day I will blog about it. Probablly after talking it over with my interesting but tediously Progressive aunt, who did my family the dishonor of renouncing her nobility. What is the tech level (historical and modern) of Raikoth? Tech level is about modern, but in some different directions. For example, I’ve said they know a bit more about psychedelics, just because modern people could know more about psychedelics if that had been a research interest of theirs. It’s been stagnant at about that tech level for five thousand years because it’s stuck in a telluric field (see this story for details). But its industrial base has fluctuated a bit, especially when it lost contact with the Sxiran mainland due to political strife there, so in practice it’s had to claw its way back up a few times. To be fair, that’s a pretty progressive-y fantasy. No mention of tearing down all the Brutalist architecture at all. I may never figure out what it is with conservatives and bad architecture. It sounds like Raikoth never actually had brutalist architecture? The Conservative = Reactionary meme I see around the LessWrong blogosphere is a sign of superficial pattern matching imo. As far as I can tell, the majority of US conservatives and LW reactionaries would be die-hard enemies. I dunno, I’m not a conservative, but bad architecture is really bad, and it does seem like it’s trendy to ignore this fact. Yes, but you’re more likely to come across bad architecture in yet another bland neoclassical or colonial than in any of the modern styles that the Reactionaries complain about. Really? I have yet to find neoclassical architecture that bothers me nearly as much as modern. You’ve probably got some availability bias regarding neoclassical vs. modern architecture. If you’re comparing the Capitol and the White House to that one concrete building that hasn’t been cleaned since 1973, of course modern architecture is going to come out the lesser. (Although, considering only well-known government buildings isn’t a guarantee of good neoclassical – the Supreme Court building, for instance, is hideous.) Also, remember that modern architecture doesn’t just refer to all-concrete buildings; if there’s prominent use of glass, metal, or plastic paneling, it’s probably modernist. It’s possible that my view is somewhat shaped by living near a whole lot of really excellent modern architecture, and a whole lot of samey neoclassical. My beloved first elementary school deserves special recognition – it’s not only Brutalist but energy-efficient and eco-friendly, so the reactionaries around here would hate it. Why don’t you correct this bias by availing us of other examples? Give us a picture of your excellent Brutalist school or pictures from 1973 and 2013 to show how lack of cleaning ruins concrete buildings. Why don’t you correct this bias by availing us of other examples? I can’t give you my own photographs, but here’s a selection of modern architecture that I approve of on Wikipedia. I’ll note, though, that it’s actually proving quite hard to find stuff that’s as good as my hometown; this would be much easier if I were not paranoid. Unfortunately, for privacy reasons I would prefer not to do that. My school is sufficiently distinctive that a photograph would probably identify it, and my family home is very close by. or pictures from 1973 and 2013 to show how lack of cleaning ruins concrete buildings. Show me a picture of ugly Brutalist architecture that doesn’t prominently include decades of grime. Seriously, they all do. Okay, my problem got a lot easier when I stopped trusting the Wikipedia editors and just checked all the images in Wikisource. Apparently, they have crap taste in modernist architecture. Of those last four, the tax court is the only one that is aesthetically neutral. All the others are actively ugly and the Norrköping library actually is of the “a pity concrete doesn’t burn” variety. The only problem with the library seems to be that it’s poorly cleaned, though there are other angles on the building that are less flattering. I can see why you might dislike the last image (although I personally do not), but I’ve got no idea at all why you’d have any problem with the second. I should have been more explicit about focusing on Brutalism, rather than modernism in general. Intrism, you have twice complained about the monotony of neoclassical architecture. Compared to outright ugliness, that seems to me a pretty minor complaint. Maybe I should have mentioned that earlier (though Scott pretty much said it). No, your examples do not improve my opinion of Brutalism. Your examples, except for the metro, seem so typical that I am surprised you think that they would be a cure for availability bias. A google image search yields a much more diverse sample, though rather uglier. I assume this means you’re filtering out all of my examples that you consider insufficiently ugly, hence insufficiently Brutalist? Unfortunately, my interesting examples were constrained by my privacy paranoia; as a result, the images I had were more central than I had hoped for. I will, however, provide additional images of the Washington, D.C. Metro system, since you apparently found it interesting. Intrism, you have twice complained about the monotony of neoclassical architecture. Compared to outright ugliness, that seems to me a pretty minor complaint. Bland neoclassical is ugly, though. As I mentioned to Scott, neoclassical benefits greatly from having excellent buildings like the U.S. Capitol and the White House as the most prominent examples of the style. More central examples, though, would be things like those suburban houses that actually think they can get away with having columns, or pretty much any building on an U.S. state university campus, or the Supreme Court. If you’re going to assume I’m here in bad faith, I don’t see much of a point to this conversation. Yes, State U buildings are bland, but I don’t think that they are ugly. I prefer them to the Brutalist examples you gave, let alone the ones that google gives. Images on the web lose some aspects of Brutalist buildings. Perspective seems to matter more for them than for other styles, particularly the experience of changing perspective. Distant images lose the texture of the concrete. I recall a classmate praising a particular Brutalist building for its variety of textures. I tried to appreciate them, but failed. I personally found the Supreme Court building to be stunning and breathtaking, so YMMV. I’m wondering whether an education in rationality without the need to make decisions which make a difference would work very well. I feel like it worked for me 🙂 And many of the people I know. Thanks. I’ve believed for a long time that conventional schooling damages people by keeping them in simulationland for too much time, but the problem might actually be that rationality isn’t taught. In this day and age, combining an ordered society with durable and centered institutions with progressivism is actually pretty unusual. It used to be more common. 1800s to 1950s Progressivism aspired to it. Even those I would say tended to have at most semidurable institutions. You’re going to have to explain to me how when YOU propose massive changes to society with a more centralized system of government and so on, it’s Reaction, but when I do it, it’s a vision of the New Jerusalem. You’re proposing an unvisited point in society-space that you believe to be a local (if wide-ranging) optimum or near-optimum based on hypotheticals, Konk is proposing a previously visited point (or the region near it) he believes to be merely higher than the present? Do the Raikoth write poetry? Your description of the ‘perfect language’, Kadhamic, makes me wonder: if Burns starting reciting “O my love is like a red, red rose”, I get the impression he’d be leaped on by twenty people saying “Definition! Fallacy! False to facts!” I suppose they could use your “near-certainly false” modifiers, but I get the impression that eventually a race of perfect rationalists would simply have no use for invented materials that are basically lies. In other words, the Priests of Beauty cannot break the seal of the confessional. Which is of interest to me, because there have been real-world attempts (including in my own country) to introduce laws and/or regulations about this, in the context of child abuse. If someone confesses that they are or have been sexually (although I suppose physical abuse is also covered) abusing a child, mandatory reporting is supposed to kick in. But that is completely against the principle of the seal, which is not supposed to be breached under any circumstances (see St John Nepomuck for an example of an alleged martyr for the seal). How do your Raikoth deal with that, or is it that the perfected society has weeded out all such tendencies? How did they deal with it before centuries of ‘gardening’ perfected the populace? I suspect that’s a non-issue, what with the Utilitarian supercomputers running the country and the eugenics-improved population. Which country are you in, incidentally? I’m strongly reminded of similar attempts we’ve had in Ireland; although it’s (thankfully?) unconstitutional to mess with the Seal here, same as doctor-patient confidentiality and a few other such things. Ireland indeed, although there were some murmurings of similar laws or attempts in America. As you say, the Raikoth have been ‘gardened’ for millennia (and why does that make me think of the Cathari, the “pure ones”?) so the issue is probably not pressing, but before they were completely perfect, I’d like to know what pressures there were to admit exceptions to the Priests of Beauty keeping total confidentiality and how they worked it out that it would not serve society. I’m in favour of maintaining the seal myself, but I’d like to see the Raikoth side of the discussion from both those in favour and those opposed to it. Well, Kadhamic is used for political and philosophical discussions. Poetry is mostly written in the vernacular, although the vernacular and Kadhamic cross-pollinate a bit. There are a couple of typically Raikothin forms of poetry (a lot of the Raikothin stuff I write is a combination of the style in the Song of Hiawatha mixed with some of the Hebrew tropes I learned for my Bar Mitzvah) and some important epic poems (I wrote one book of one of them then quit). Yes, I based that principle partly on the seal of the confessional and partly on stories I’ve heard of people who are suicidal and tell everyone except their psychiatrist because their psychiatrist might commit them to a hospital. This seems incredibly stupid and I am pleased to get rid of it. As for how they deal with it – well, they don’t. If someone tells a Priest of Beauty they’re doing something horrible, and the Priest can’t make them stop, and no one else discovers it, the horrible thing continues to get done. Too bad, but in my opinion a valid trade-off. I actually think of you not as a Progressive but a 2010s Conservative. Wait 40 years and you may find yourself described in that way by more people. What are the military capabilities of Raikoth? I ask because I am keenly interest in the mineral resources of the Bejeweled Plain, and feel that they necessitate immediate humanitarian intervention in order to free the jewels from the chains of Talain tyranny. About 50,000 infantry, a few dozen ships and planes, some polar bear cavalry (ceremonial, but still), and two of these guys. Marvellous stuff! Better hope there is no global warming, though. I want to play this game! I want to play this game! How do I play this game? And when I find sweeping revolutionary changes I would be up for, by bad luck they’re all ones well outside the mainstream of debate, which focuses disproportionately on stupid tribal issues anyway. Sounds very well governed, but I wonder how the people spend their time other than meditation etc. I can think of some interesting ideas. Does anyone ever try to take over by becoming a Utility monster? I was wondering about that myself. It’s chilling to think that the default assumption is that most of our time is spent on inefficiently getting a little done and enduring the consequences of our own and other people’s messes. My first thought is that the standard for mastery goes up, maybe to 20,000 hours. On the other hand, does putting more and more into better art, music, architecture, gardens etc. make utilitarian sense? Maybe it does, but I’m not sure. So how serious do you take the Kadhamic thing? Because if you actually thought it to real people, I’d predict it to develop into a normal language within a weak. As a dabbler in lojban, I noticed this as well, but to me, Kadhamic resembles Ithkuil more (There was an interesting New Yorker article about it not too long ago). Lojban, though it shuns ambiguity (syntactically, at least), embraces vagueness. While it’s possible to be much more precise in lojban than in English, e.g. using a variety of the tense, aspect, and prepositional tags, as well as evidential markers, a powerful system of logical and non-logical connectives, and multiple negation forms , it’s possible to be much vaguer as well. The lojban sentence “prami” could be translated to English as “I love you”, “You love me”, or “John will have loved Jane” depending on context (tense and referants can be left up to contextual inference). The White House (la blabi zdani) could be refered to as “the blue dog house” (le blanu gerku zdani) if you consider Obama to be insufficiently democratic, and further referred to as a “dog house” (lo gerku zdani) if you wanted to be derrogative, provided that context is sufficient to be clear. … That was an unintendedly long diatribe. Scott: I assume you are now, even if you were not at the time you concived Kadhamic, familiar with lojban. Are you also familiar with Ithkuil and could you give a comparison to the two? Why do you think it would become a normal language within a week? There’s also a vernacular to handle normal conversation, and Kadhamic is just used for specialized tasks. (one possibility I’ve been toying with is the idea of a Kadhamic “parser”, a computer program that you can run essays through that would enforce the rules of Kadhamic grammar. This sort of thing could ensure the language doesn’t degenerate, or that if it did merge with the vernacular, it would be to the vernacular’s benefit). Yes, I’ve heard of Lojban. I like it, but it seems to be going a different direction – it’s about making language easier to learn/understand/speak and unambiguous, and less about trying to import philosophical rigor. See this comment for more. Lojban is meant to be a spoken language, so some of its design choices are targeted at ease of use and unambiguity, but these are important for philosophical rigor. Its parent language was initially designed to “Test the Sapir-Whorf Hypothesis”, which in practice meant that it needed to allow for extreme precision in many dimensions. – Statements in predicate logic translate very cleanly to lojban (because that’s its basis). Well basically I think the Sapir-Whorf-Hypothesis gets the direction of causality exactly wrong. Languages lack words for concepts because the people using the languages have no use for the concepts. If they did have such a use, they would make up a word. People still have the thoughts Kadhamic tries to ban, so if you force them to speak Kadhamic it will expand to express them. The natural way for that to happen is mistakes that will become common and then stop to seem wrong. For example, a lot of people will just omit the “necessary” modifiers. You can already see that with people learning real languages, their thoughts get expresses in grammar-violating ways until they learn the actual grammar to express it. If you go with the parser, phrases will have to acquire unofficial meanings. For comparison, I hear the French say “if you want” for “please”, but that clearly doesn’t imply what “if you want” would imply in English. Similarly, “by personal experience” could easily decay into a phrase nobody actually analyzes, and the evidential modifier system would be effectively dead. Same for “42 aheistst break the law”, like the Bible is full of numbers that aren’t or Latin uses “for centuries” in the meaning of “forever”. I heard some claims that this happened to modern Hebrew and it is now basically a European language mapped to a Semitic substrate by phrases abused in standardized ways, but I don’t know if that is actually true. Of course you could go beyond the parser’s syntax-enforcement and enforce semantics, but at that point the language doesn’t do any work anymore, then you are just banning expression of certain thoughts you could also ban in the vernacular. I heard some claims that this happened to modern Hebrew and it is now basically a European language mapped to a Semitic substrate by phrases abused in standardized ways, but I don’t know if that is actually true. Testing the Sapir-Whorf hypothesis was really more of an interesting premise than anything actually practial (or at least it’s become that). About unofficial meanings, I think that a small degree of curation can do a lot to curtail linguistic drift. For example, all material published in Kadhamic in any official capacity must pass a series of automated style tests, and considering the state of modern NLP technology, it should be possible using Raikothin computational tech to detect non-standard uses and forbid them; this won’t, of course, stop the development of the vernacular, but it could keep it out official use (especially if, e.g., transcripts containing improper grammar or unidiomatic wording were seen as weak indicators of unfittness to lead). The Priests of Joy seem like a weak point; what prevents them from (whether consciously or not) tweaking the Angel’s algorithms to benefit themselves at the expense of total utility? 1. There aren’t many Priests of Joy; according to my notes there are only 500 of them, making them about 1% of the size of the other two Priesthoods. Their ability to seize power, and their ability to siphon off a lot of wealth to themselves, are pretty limited. 2. The important stuff is in the Risurion-silk, a centuries-old holy book that can’t be edited much. The stuff the Priests of Joy control is things kind of like the equivalent of the “hot” versus “best” functions on Reddit – large-scale changes to algorithms that probably wouldn’t operate on any scale fine enough to affect these five hundred priests. 3. Pro-social education blah blah blah. 4. Corruption is hard and punished strictly. Might make a new post about this. What is the marriage culture like in this world? You mentioned reproduction but do the people fall in love and get married or do the Angels dictate who will reproduce together? I’m trying to avoid anything obviously dystopian, so no, the government does not control who you marry. This is probably a complicated enough topic that I should turn it into another post. I find this pretty cool because I like conworlds and utopia attempts and actually identified jokingly as an anarcho-totalitarian for a while, though no nation I’ve ever conceived of is nearly as utopian as Raikoth. (Less relevant, I also identified as trihumanist; my motto was “embrace the triangularity!”.) I’d say more, specifically about Kadhamic and Ithkuil etc., but it appears I’ve been beaten to the punch. I notice that the book in the coat of arms is similar but not identical to the book in the header of this site. The header’s book has a gray star and a red N beginning the text. Did Raikoth itself change its coat of arms over time, and if so, what for? Or did you just like the look of one version more, but updated only one of the images? Or is the difference reflective of a difference between the Shining Garden of Kai-Raikoth and Slate Star Codex? Yes, I lifted the header image from the Raikoth coat of arms, which I guess is also my personal coat of arms seeing as I don’t have a better one. The ‘N’ is for anagramming reasons, as explained in the about page. Oops, this was supposed to be a reply to the above comment. Would normal imperatives have to become hypothetical imperatives? Does “close the door” have to become something like “if you don’t close the door I will be mad”? I imagine you would have to say “You should close that door, unless you want me to become angry with you” (eliding probability assertions). Someone who spoke like that, though, would be seen as rather aggressive – better to say “You should close that door, if you want me to be a little bit happier with you”, and better still “You should close that door, if you want to maintain the room’s temperature”. “I desire that you close the door” ? Do assertions about your own desires require a confidence modifier? You can certainly desire something and then regret it later, but is it even possible to be mistaken about the fact of your current desire? Good question! I never thought about this. I’m not sure if it would cause philosophical problems to not have this feature, but it seems like it might be more elegant to include it. I’d like to hear more about the corrective monasteries – do prisoners choose whether they go into exile or to a monastery? What happens if they get there and then don’t participate in work, meditation, etc? OK, this conworld thing sounds fun – where do I add my own country? The Micras / Bastion Union forums? The Shireroth wiki? The Micras Wiki? The way it works on Micras is you can do whatever you want but have to convince other people to take you seriously. For example, to join the MCS you usually need a couple of people in your country and a history of having existed for a while. Bastion is less well-specified but they have been known to reject people, and one person coming in with no previous history of micronationalism would be exactly the sort of person they would reject. It’s also been noted that almost everyone who comes in on their own never really integrates with anyone else and quits after a few weeks. We don’t really know why and it annoys us. If you’re really interested to the point where you don’t mind bureaucratic snafus, I would suggest posting on Bastion and asking if they want to give you a forum. If they don’t, I will give you a subforum in Archipelago, which was a small project of mine on Bastion that was supposed to solve exactly this problem but is now sort of defunct. I wonder about this. I’ve come to the conclusion that I have no idea what people’s average default desire for children is– there’s always a lot of influence from other people and from economic factors. However, Raikoth would probably lead to people having a moderate preference for procreating. At least, a number of the costs to parents would be lower. Neighbors would be willing to help with raising children, the neighbors and the parents would share values, and the neighbors would be trustworthy. I think the Raikolin would select for babies that start sleeping through the night at an early age, and/or figure out how to improve the odds of sleeping through the night. The pro-social values in Raithoth should be that family relationships would be much easier and more pleasant than they typically are in the real world. On the other hand, the desire for a large family would probably be selected against since resources seem to be somewhat limited. I imagine Raikolin as generally being willing to have 2 or occasionally 3 children if asked. If it’s hard to move to Raikoth but the culture has a number of attractive features, I imagine that there are people from other countries who do more or less good imitations of Raikoth. I don’t know. Countries with very low birthrates have tried responding by making parenting extremely economically advantageous and socially rewarding, and it’s never really seemed to work. Germany and Japan are my two best examples. These are also countries where it’s very pleasant to live (well, Germany at least, Japan has other problems) but Germany still has the lowest birthrate in Europe, which is the lowest-birthrate continent in the world. It sounds like you’re sidestepping a whole mess of problems by declaring that Raikoth is an intentional community, and that anyone who doesn’t agree with your government gets exiled. As a law enforcement tactic this has a lot of very appealing properties. But I can’t help but notice that no real-world developed nation does this, which makes me think there might be some drawbacks I haven’t thought of. (cf. Chesterton’s Fence) One potential drawback might be that everywhere has been colonized already, but I’m not sure I believe that. If we really tried, I’m pretty sure we could find a decent-sized uninhabited tropical island somewhere. So why aren’t we deporting all our convicts? Do you recommend this sort of intentional-community thing for real world nations? If not, why does it work for Raikoth when it wouldn’t for the US? Politically speaking, the idea of Nationalism tanked this from working. It would be a huge international scandal to exile your citizens permanently, because everyone is supposed to have SOMEWHERE to go. At which point you might as well just create a general AI rathe than this society, because you’ve solved Friendliness.